Trail riding and going to your local round up clubs events and play days are some of the most relaxing and enjoyable things you can do with your horse. They are a fun way to meet and associate with other horse people. It’s also a great way for kids to get started riding and working around horses. Here are a few tips and guidelines to follow when participating in these activities. If your horse is a real go getter, don’t try to keep him at the back (unless you know everybody and your doing on the job training) This can cause other people to have trouble if your horse is prancing in place, going sideways etc. If you’re horse is “anti-social” (i.e. a kicker), put a ribbon on his tail. Most horses that kick on the trail have a fear issue. Or if you‘ve got a friend that your horse tolerates have them ride with you. 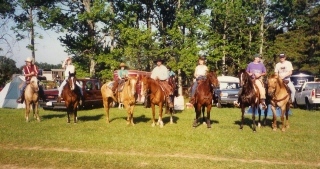 On big, organized trail rides, running is usually discouraged. Always be nice, courteous and respectful. For Roundup clubs, play days, etc. Always get your horse ready (when possible) at home, or get there early enough to do it there. It’s amazing that more people aren’t hurt at these events by folks “exercising” (running the dickens out of) there horses outside the arena. Remember, your horse can have a “bad” day once in a while. They might have ran the pattern perfectly at home – but once your there… Public places (most of the time) aren’t the best place to “train” your horse. We’ve all seen the horse owner beating the heck out of their horse, or trying to jerk his head off just because the horse didn’t perform well. Most of these cases are because proper training at home didn’t take place. Horses are allowed to have bad days too. Heaven knows people do. Don’t overdue it. We’ve all seen the really fat pony that was probably saddled for the first time this year – that morning, and is entered in every event. It’s no wonder the pony finally sulks up, bucks, or just runs off – it’s the same with colts. Too much too quick (overexposure) can ruin all that hard work you’ve put into it. For questions or other trail riding and play day tips, please contact us.